A medium grouse with an impressive fan-shaped tail and a crested head, the ruffed grouse takes its name from the black ruff of neck feathers that the males display in defense of their territory or to impress hens. Ruffed grouses tend to live in deciduous and mixed forests and overgrown pastures and clearings throughout Canada and a few of the northern and eastern U.S. states. They are more likely to be heard than seen, and the males' are famous for their territorial "drumming," which is produced by rapidly beating their wings against the air. Thank you for considering the ruffed grouse as a candidate in the voting process for Canada’s National Bird. The ruffed grouse is found in all Canadian provinces, the Northwest Territories and the Yukon. The only place it is absent is Nunavut. This is truly a Canadian bird, built for the Great White North. They have small growths resembling the teeth of a comb (called pectinations) growing from the sides of their toes, which act as snowshoes in deeper snowfall, and they grow additional feathers down their beaks that ensure they are breathing warmed, filtered air. They like transitional habitat but are very adaptable, found in types of mixed forest across the country. Throughout Canada’s history both Natives and pioneers depended on this grouse for food. It remains an important food source in northern parts of the country, and grouse hunting is a time honoured tradition that has introduced many young folk to hunting. We feel that the ruffed grouse (Bonsa umbellus) should be the foremost candidate for Canadian national bird. No other Canadian Bird can boast such a wide population distribution, and it is truly a symbol of what is wild and free in our great country. It would be remiss not to point out the shortcomings of some of the other candidates for this most prestigious appointment as the Canadian National Bird. One of the most obvious deficiencies in many of the proposed species is that they are not “Canadian” birds at all, but rather just summer visitors — much like American tourists. Included in this group are the common loon and the Canada goose, the latter of which has become a nuisance bird in our parks and cities. In the case of the other grouse species proposed for National Bird, the sharp-tailed grouse and the rock ptarmigan are by-in-large regional birds (similar to the snowy owl), and therefore could not be considered as truly representing the nation. In the case of the spruce grouse, we would take exception to its reported range of distribution; in fact, in many parts of the country it is exceedingly rare. We are of the opinion that the bird chosen as Canada’s National Bird should not already be an official provincial or territorial bird but should be a unique symbol of our great country. I give you the Ruffed Grouse. Not only is the Ruffie found throughout Canada (except Nunavut apparently) but it is a beautiful bird to see and to hear. It makes you gasp when it explodes into flight a few metres in front of you; and it stops you in its tracks when you hear its wing-drumming crescendo. Usually modest, but generally friendly, well-grounded bird. Can appear dull, but can put on quite a display when necessary. I went thru a bunch of the birds that you have on your list looking for a bird that stays in Canada for most of their live and the Ruffed Grouse fits the bill for me! I didn't want to choose one that only summers in Canada but the rest of the time is in USA. Everyone knows a ruffed grouse (partridge) when they see them in the morning on the trails picking at stones and drying off the morning dew from their wings. Not one of the prettier birds from the list but I think it is a true Canadian bird! There are in every province. Best tasting game bird! King of the uplands. Found all over Canada. The ruffed grouse is found in nearly all of Canada, is non-migratory and is not an official provincial bird. Please consider the ruffed grouse as the perfect candidate for National Bird of Canada. I think the ruffed grouse could be the National bird because of the relation that the bird has to Canada. It is here year round, even in the winter. It has a long history of being a good bird to hunt. The amazing "boom" echo it can make through the woodlands, and how it can adapt to the vast lands of Canada (habitat). Ruffed is thé bieutifull and more difficult bird to understand. It's a pleasure to try to kill couple over ours setters. There is no other bird that could qualify more to be Canada`s National Bird.Especially now that it`s population is decreasing so fast due to the introduction of another game bird. Populous, widely distributed and delicious. The Ruffed Grouse is the best canadian representative I can think of. The Ruffed Grouse is a resident of Canada--year round! I think our National bird should be of the Canadian pioneer spirit with the fortitude to endure our winters--and not desert his/her homeland by flitting off to warmer climes when the snow blows and the going gets tough. And when winter is over, greets the Spring in true pioneer spirit by performing elaborate displays of dance on the communal dancing ground, on a hilltop to which they return faithfully every year. That's a true Canadian bird to be proud of!! I believe that this should be our national bird. This bird is found across Canada and is looked at as a representation of our great north. 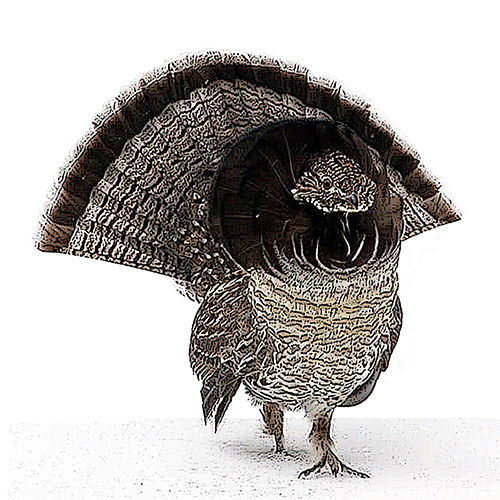 The Ruffed Grouse is found country wide , good looking bird & the best eating game bird there is. as well as being a lot of fun to hunt. This bird ranges across Canada. It stays with us during our winters and can be seen without going to a bird sanctuary. 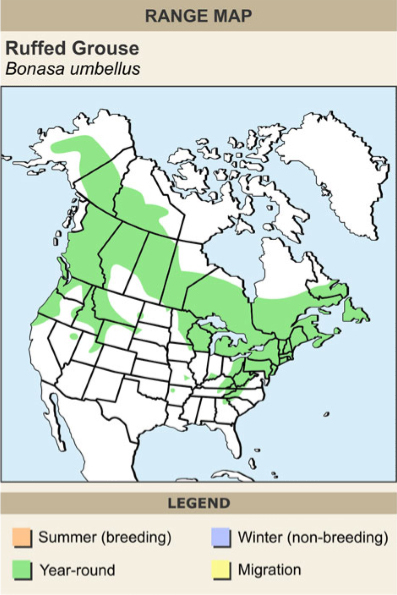 I feel like the Ruffed Grouse may be worth considering for the national bird as it is a year round resident and has a very broad distribution within Canada. The only province/territory it is not located in is Nunavut. The Ruffed Grouse can be found across Canada year round. No wintering in the south for this tough Canadian. Its our own wild chicken! The sound of the male beating its wings is the sound of home. Where can you go in the great Canadian wilderness and not hear this iconic sound? The ruffed grouse for sure. This is a hard decision. I love watching the Cedar Waxwing; they are my very favourite. But to vote for our national bird - that's difficult. I want to say the Great Blue Heron, mostly because it reminds me of home. But the Common Loon and the Canada Goose just makes sense. I had no idea we had a Warbler named after us. But I think it comes down to the Ruffed Grouse. It spans most of our country, is resourceful and makes a mean chainsaw sound effect. The ruffed grouse is as Canadian as a bird can get. The bird actually has small feathers on its feet that act like snowshoes. There is no better candidate for national bird.